Tom Garcia watched in terror as fingers of water pushed inland across the beach and began filling up his home. His wife handed him a drill and Garcia used screws to pin his front and back door shut. But soon the storm surge from Hurricane Michael was up to his chest. His dogs sat on his bed as it floated. He said it took all of his strength to hold his sliding door shut as the waters outside the glass rose higher than those flooding the house. 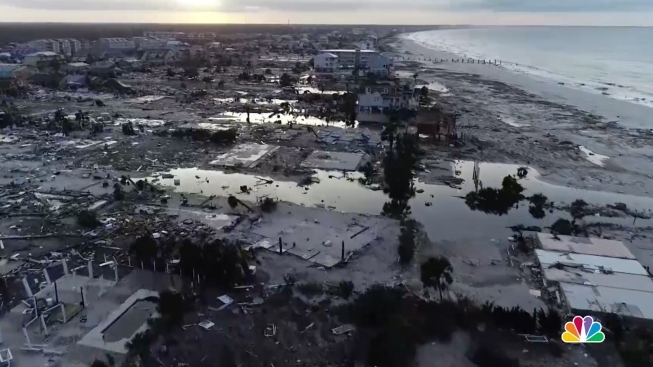 "It was life or death," Garcia said through tears Friday as he walked amid the destruction in Mexico Beach. Michael was one of the most powerful hurricanes to ever make landfall in the U.S., and this Gulf Coast community of about 1,000 people was in its bullseye Wednesday. While most residents fled ahead of the storm's arrival, others stayed to face the hurricane. They barely escaped as homes were smashed from their foundations, neighborhoods got submerged, and broken boards, sheet metal and other debris flew through the air. Hector Morales, a 57-year-old restaurant cook, never even thought about evacuating. He grew up in Puerto Rico, where he said "you learn how to survive a storm." His mobile home isn't on the beach. But the canal lined with boat docks behind his home quickly overflowed as the hurricane came inland. Soon, Morales said, his mobile home started floating. "The water kept coming so fast, it started coming in from everywhere," he said as he sat outside on a broken set of stairs lying atop a mattress and other storm debris. "I had about 3 feet of water in my house. That's when I decided to jump." 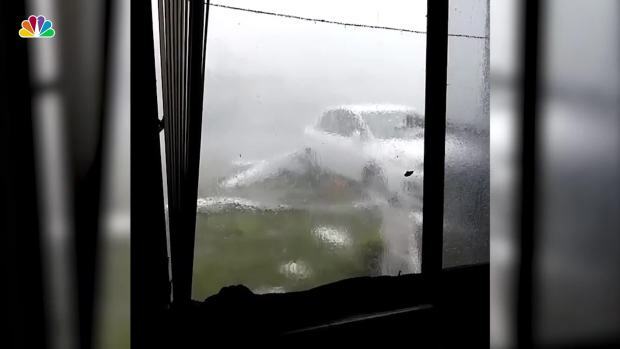 He got through a window of his home on to the top of his car outside when Morales saw two neighbors wading through the rushing surge. He swam out and grabbed a utility pole, then reached out and helped steady the wading couple. They fought their way onto a fishing boat that had been tied to a palm tree and climbed inside. Morales left his neighbors in a bathroom below the boat's deck, while he sat in the captain's chair. 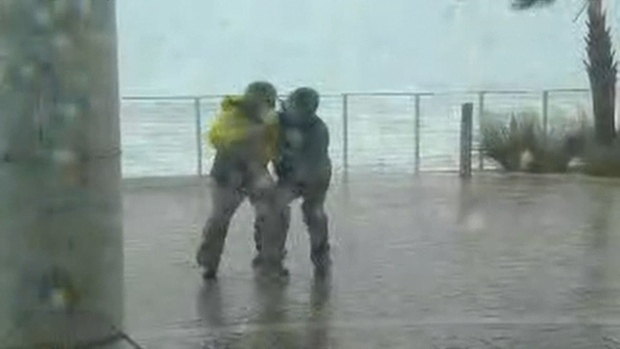 He said they stayed in the boat for six hours before the winds calmed and the surge receded. "I lost everything — my clothes, wallet, credit cards," he said. "But I made it." Bill Shockey, 86, refused when his daughter pleaded with him to leave Mexico Beach. He said he didn't want to leave behind his collection of "Gone with the Wind" dishes and antique dolls. So he stashed those valuables up high in a closet before heading to his daughter's newly built two-story home next door. With a pocket full of cigars and his cat named Andy, Shockey watched the hurricane roll in from an upstairs bedroom. The wind shredded the roof of his single-story home. Water rose nearly to the top of his garage door. A neighbor's home across the street got shoved off its foundation. Was he scared? "Worried, I think, is more like it," Shockey said. His daughter's home took in some floodwaters downstairs, but was otherwise unscathed. Shockey's own home of 24 years didn't fare so well, though his collectibles survived. "It's a wipeout," he said, adding that he plans to sell his property rather than rebuild. "Whenever they want, I'm going to move in with my son in Georgia." For years, Hal Summers has managed Killer Seafood, a Mexico Beach restaurant known for its tuna tacos. Michael destroyed the eatery as well as Summers' townhome on the beach. Summers rode out the storm at his parent's house nearby. They had evacuated, but an elderly friend was staying there and Summers promised to watch him. 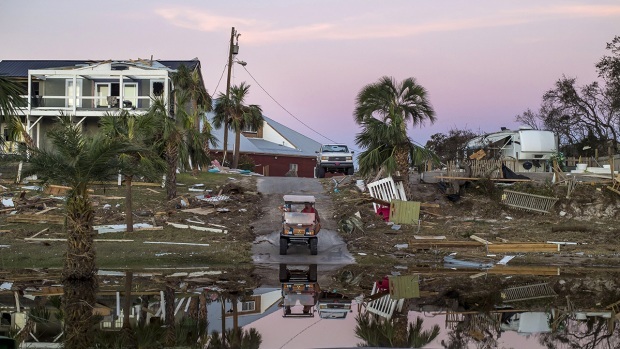 Summers knew they had to get out when, about 30 minutes after the storm made landfall, water surging into the home's kitchen rose up to his neck. He opened the front door and fell in deeper when he tried to step onto front stairs that had washed away. Summers said his parents recently added a large, outdoor bathroom onto their home and he saw the door was open. The large sink was still above the water. He grabbed a bench that was floating by, and shoved it into the open bathroom to give them something to stand on. Then he helped the elderly man inside. "I knew we could sit on the sink or we could stand on the sink if we had to," Summers said. "I had to hold the door shut or it would just keep flooding. There was a little crack and I could just see everything flying. I thought, 'Oh my God.'" They never had to stand on the bathroom sink. Finally, the flooding receded. While Garcia and his wife survived the hurricane's wrath, he was out Friday searching for his daughter and mother. Kristen Garcia, 32, and her 90-year-old grandmother, Jadwiga Garcia, were staying in a second-floor beachfront apartment Wednesday as the storm came ashore. Garcia said his daughter called him to say the apartment was flooding and they had taken shelter in the bathroom. He hadn't seen them in the two days since the storm passed, and hadn't been able to gain access to their apartment. He had tears in his eyes recalling their last conversation. "She said, 'Dad, get down here,'" Garcia said. "I said, 'It's too late.'"